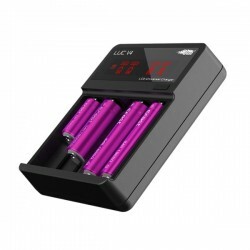 Battery chargers for high-drain/ 18650 vaping batteries. Chargers There are 4 products. 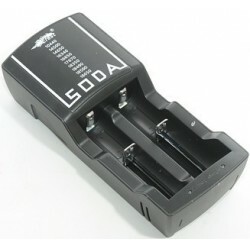 Efest Soda Dual Battery Charger (With NZ AC plug) Charges 2 high-drain vaping batteries simultaneously. Over-voltage, over-discharging, short-circuit and reverse polarity protection. 10440/14500/14650/16340/16650/17650/17670/18350/18490/18500 & 18650 batteries. 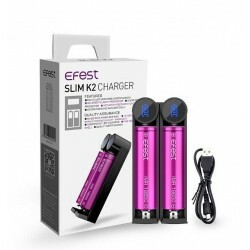 Efest Slim K2 Battery Charger Features include: reverse polarity, over-charging detection, and short circuit protection. Charges: 20700, 26650, 18650, 18500, 18350, 17340, 16340, 14500, 10440, 26500 Li-ion batteries. Efest LUC V4 Battery Charger Four Bay LCD Universal Charger with NZ AC plug and Car Charger. Charges: 10440/14500/14650/16340/16650/17650/17670/17350/18350/18490/18500/18650/20700/22650 Li-ion batteries. USB eGO Charger Charges via computer usb port or any universal power adaptor with 5v output. eGo threaded.